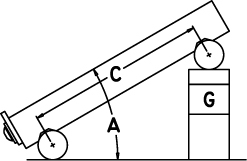 To set an angle on any sine device, whether it is a sine bar, sine plate, or other sine tool, you must first determine the center distance of the device (C), the angle you wish to set (A) and whether the angle is in degrees-minutes-seconds or decimal degrees. Next, enter that information in the appropriate input areas below. Use a decimal point for the separator, whether the angle is in degrees-minutes-seconds or decimal degrees. Hit the 'Calculate' button and then assemble a stack of gage blocks (G) to equal the size that is returned. The units of the stack will match the units of the center distance (i.e., If you enter the center distance as 5 for a 5 inch sine plate, the gage block stack will also be in inches.). Place these gage blocks under the gage block roll of the sine device and the desired angle is set. Tighten the locking mechanism on those devices that have one and you're ready to go.